I describe my visual art practice as neo-conceptualist, new genre work since I explore areas of meaning production in a variety of media. Recently, I have been experimenting with cinematic formats to create visual discourse within other media. Art writings and artist interviews are published in artUS magazine (Los Angeles) and various artist websites online. Artwork is available at Katharine Mulherin Contemporary Art Projects and p|m Gallery in Toronto. Otino Corsano continues to reconstruct cinematic elements into new genres for his latest “Banner Year” solo exhibition presented by p|m Gallery. These new paintings feature celluloid-like images of scrolling banners – both with and sans mottos. 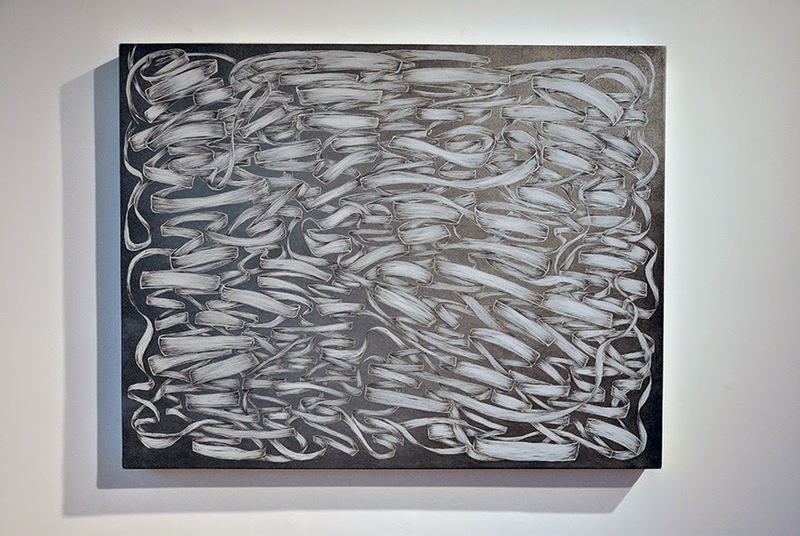 Undulating forms relate to the analog essence of both cinema and painting in the digital era. Contemporary heraldry of corporate branding is also referenced. Corsano’s recent work tracks new dialogues through a fusion of oscillating film structures and the highly archival medium of painting as a perpetually resurfacing discipline. In early 2008, Corsano commissioned the creation of twelve wood panels to be constructed at three times the scale of the original 2007 iPhone. These solid wood forms were produced prior to any public knowledge of the development or release of the first iPad in 2010, although they are similar in dimensions. Featuring rounded edges and silver casing, the resulting series of wood-burned paintings document inspirational quotes from artists, collectors, dealers and other art world insiders culled from the artist’s memory. 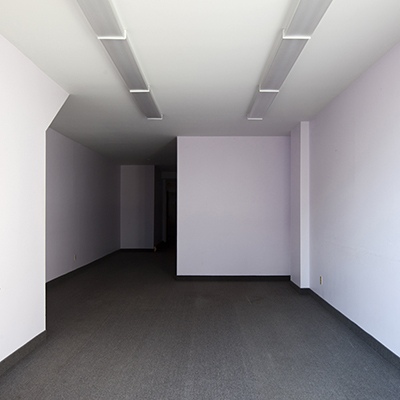 Linked to the Los Angeles art community, Corsano’s visual art practice consists of neo-conceptualist, new genre work. He explores areas of meaning production in a variety of media and established Ocean Course Films as an entity to consolidate his collaborative multimedia projects. 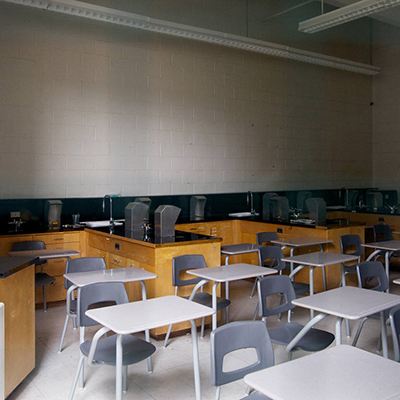 Corsano has taught at the University of Toronto and is an Instructor at OCAD University. 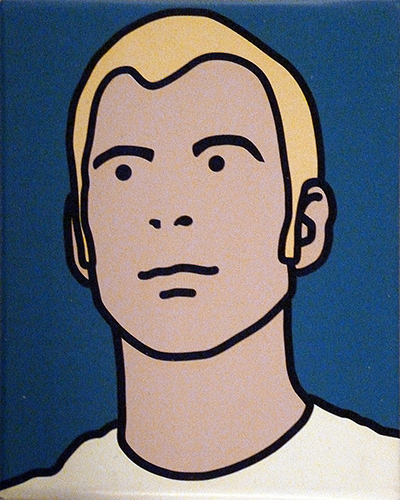 He completed his MFA at Otis College of Art and Design in Los Angeles in 2000. 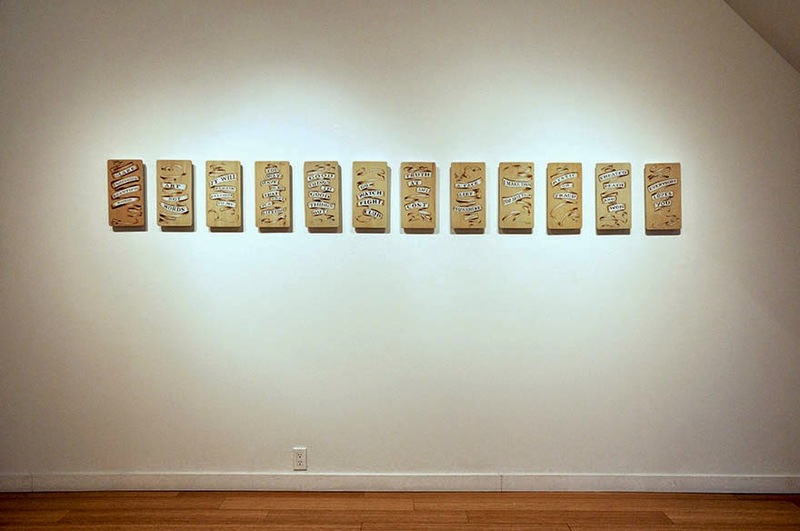 “Banner Year” is Otino Corsano’s fourth Toronto solo exhibition with p|m Gallery. Otino personally thanks Pete Commanda for his wood burning expertise. The work included in my latest “Banner Year” solo exhibition revisits painting in ways informed by my earlier cinematic experiments and more recent video projects. 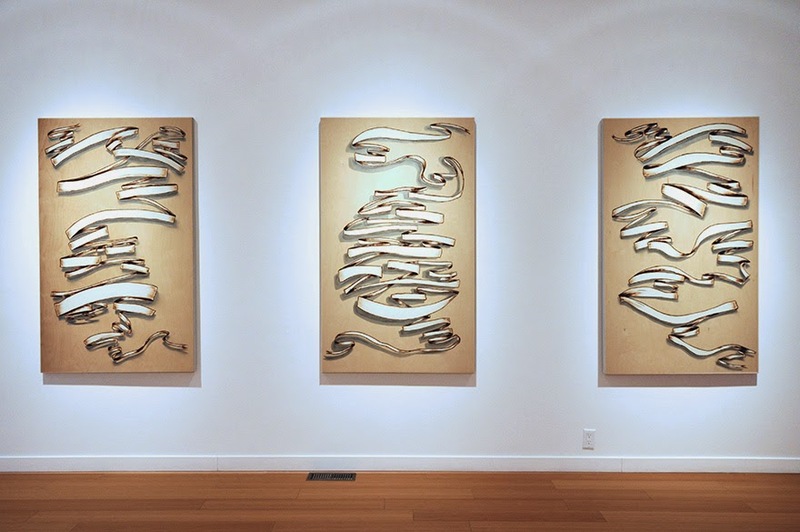 I planned for the undulating forms in these paintings to carry and signify the structure of speech – or more specifically film dialogue – as well as the language of painting itself as a visual medium. These scripted language motifs are also employed as Institutional Critique strategies: the challenge to uphold the first principles and slogans we generate by our everyday actions through new performances. Or even as a simple attempt to satisfy the responsibility painting owes the contemporary viewer. Returning to the study of Ed Ruscha’s blank signs and bleached-out text block paintings, I developed this new work to explore the dichotomy of pervasive marketing catchphrases camouflaging as motivational phrases. Larger panels and canvases drop text in favor of free visual movement as divulgence. Waveforms demarcate baroque structures advancing in all over directions, advancing the modern notion of the brush stroke as signifier of text/speech actions. Over scorched and spray-painted surfaces, visual sentences are carved out to offer an optimistic, new narrative for painting inspired by digital motion. I spent a great deal of time in my studio reflecting on the practices and words of indivduals who remain important to my artistic progressions. Nevertheless, I hope to have formed new justifications for the highly archival medium of painting by generating new fusions with the fleeting cinematic language and discipline of filmmaking in the light of emergent technologies. Working alongside commercial directors, professional actors, contemporary dancers and composers, new genre artist and Willowdale resident Otino Corsano has created a trilogy of art videos collectively titled “North York”, 2013 for Paola Polleto's "Oh Dear" group exhibition. This collection of thirty-second ‘commercials’ depicts the lifestyle of living in the City of Toronto’s most northern edge as a contemporary Arcadia. Otino Corsano's "NORTH YORK", 2013 runs during regular hours from July 2 to August 26, 2013 just past the tickets booths inside the main entrance of the Toronto Centre for the Arts. Drawing from a retrospective realm of nostalgic idealism, Corsano brings motion to dreamlike memory stills of his inner city hometown. Accordingly, the municipal zone of Willowdale becomes a narrative where the daily lives of couples and individuals are choreographed as new visual documents. The classic yet fading medium of the television commercial is activated and altered as an art format. Here, lifestyle/travel advertising aesthetics shed sales slogans to reveal timeless suburban tranquillity. I would like to thank Paola Poletto for this wonderful opportunity to work with her again. Many in the arts community talk about artist-supportive curators and Paola is this idealism in practice as it would have been difficult to find the potential to create this series in any other curatorial milieu. This series would never have been created without Paola's vision to present a North York - focussed art discourse so I am indebted to her for creating the stage for this project. Carina Samuels' help with the marketing and organization of this exhibition is greatly appreciated. The first creative artist I approached with my early concept was Collin McKelvey. I was unprepared to listen to the mysterious and deeply rich tracks he created which inevitably set the conceptual mood and texture for all three art films in the most complex and conceptual ways I would have never imagined without his sound innovation. I know his work inspired each Director and performer participating in this project as his tracks challenged them to interpret these sound artworks into visuals and motion forms. Jeff Hamill and Maddie Goodall were the first Directing Team to lead this project with the early completion of the first North York video "Optimus". Their original concept and independent vision featured an essential critical view of the theme and activated early excitement for the series. Their film also helped visualize the potential and possibilities of this series. I am especially grateful for their personal perspective featured as significant creative content. These two new young directors are definitely the ones to watch as the future of the Canadian Film community. I am already proud of this early collaboration with this amazing and dynamic Directing Duo. Without the guidance of Director Jeremy Mimnagh I would have never had the wonderful fortune to find the artistic, film and dance triple threat (more commonly known as) Aria Evans. Aria's choreographic interpretation of my rough sketches for North York video 2 "Betty Ann Bush" raised the level of my practice in just over 30 spectacular seconds. Her orchestration of subtle and cool compositions, boosted by Linnea Currie-Roberts' natural acting power, literally levitated the project to new heights. Linnea's magnificent performance was truly timeless. I am indebted to both these amazing artists for giving me the most surreal experience of re-experiencing my art re-delivered to me in greater acuity and poignancy then ever first dreamed. Thanks to Aria's great help I was able to discover the most magical contemporary dancer. Emma Letki's spectacular dance and theatrical performance lifted the North York video 3 "Lansing" film from the timelessly nostalgic settings towards a timeless Arcadian future now archived in HD because of her expert dance facility and finesse. I also never imagined I would be so fortunate as to be able to work with Superstar Westside Studio Director Nikki Ormerod on another collaborative art project. Whether coincidence or written in the stars the memory of Toronto's best day of cinematic friendly weather ever, matched with the greatest cooperation of a city's worth of municipally delivered serendipitous miracles, I can say I have the honour of experiencing working with Canada's greatest eyes once again. Special Thanks also to Bailey Govier, Caitlin Driscoll, and the amazingly supportive team at the Toronto Centre for the Arts including Director of Production Kristopher Dell, AV Extraordinaire Vadim Beili, and Lila Karim, Managing Director of North York Arts. This was a very important project for me, significant as I feel I have been given so much with the lucky opportunity to grow up and currently live in North York. Your help with realizing this artistic document in tribute to my hometown and neighbourhood means more to me than I can describe. Quite literally, this art project could not have been realized without your help and because of this and more I am so grateful to all of you for your creative contributions to this new trilogy. Quick Draw Artist Interviews are a series of interviews conducted by Otino Corsano using Facebook's IM Chat feature. Spontaneous conversations with international artists are recorded and documented specifically for publication on this blog. Quick: Jab. Models her pummels. I actually asked for a Nokia and happily settled for better than advertised. She carries heavy clout; paradoxically ultra-lightweight. He returns to me as Phantom High Speed Capture HD in Hughes/Thomson Technicolor. “Make Something Beautiful Happen.” To be scrawled on a future panel. Prepped according to scale. Half a decade ago. Peter Kingstone is a single channel and installation video artist. He lives in Toronto, Ontario Canada. He holds a Philosophy/Cultural Studies Degree from Trent University in Peterborough, and Masters of Fine Arts from York University, Toronto, Ontario. Kingstone has exhibited extensively in Toronto and internationally and has presented at many conferences on the ideas around storytelling and social engagement. He teaches at Toronto School of Art and York University and over the years has worked in a variety of administrative roles for many Toronto artist-run centres. Peter started in September 2012 as the Acting Visual/Media Arts Officer at Toronto Arts Council. Peter Kingstone is represented by Pari Nadimi Gallery. 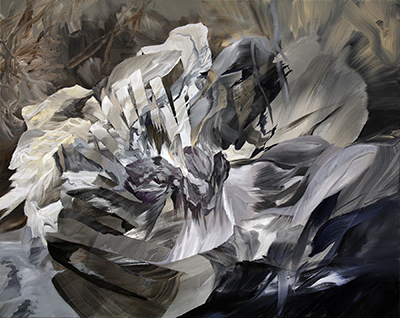 His most recent solo exhibition at the Gallery titled, "Upright Stance," was exhibited in February to March 2013. Quick Draw Artist Interviews are a series of interviews conducted by Otino Corsano using lost podcasts never originally created. Spontaneous conversations with international artists are not recorded and then transcribed from memory specifically for publication on this blog. Quick: Split. You held them up. We both watched. You asked me to address this directly and I’m wondering when this should all stop. So I too raised them alone as you instructed. Void of mimic; this was entirely new. Divided yet among; perfectly balanced and viewed again from a distance. Absence greatly appreciated. Draw: art about art. Eric Doeringer (b. Cambridge, MA) currently lives and works in Brooklyn, NY. He received a BA in Visual Art from Brown University and an MFA from the School of the Museum of Fine Arts, Boston. Doeringer has had solo exhibitions at Apex Art (New York), Katharine Mulherin (Toronto), The Fuel Collection (Philadelphia), and Another Year in LA (Los Angeles). Doeringer was commissioned by The Whitney Museum to create a multiple for their Initial Public Offerings program and has been included in exhibitions at the Museo De Arte Contemporaneo De Castilla Y Leon (MUSAC), The Bruce Museum, The Itami [Japan] Museum of Arts And Crafts, and Takashi Murakami’s GEISAI Miami artist fair. Doeringer’s work is currently featured in “Survey” at NO FOUNDATION in Toronto featuring his artwork from the past five years: recreating works by artists such as Andy Warhol, Sol LeWitt, On Kawara, Edward Ruscha, John Baldessari, Richard Prince and Damien Hirst. The gallery will be re-hung every two weeks, with each mini-exhibition containing Doeringer's versions of works by a different group of artists. Quick: Bud. Gilded framed Picasso print. A collector, old friend, bronze focus. Regatta regalia; it was he who left the massive model ship to be repaired. Gluing thin rope and then reattaching the toothpick pushpit. “Thanks for spending time.” At the doorway. Every time repeating the action reinforces tide. Chris Shepherd (b. Grimsby, ON) is represented by Bau-Xi Photo. His most recent and fourth solo exhibition at Bau-Xi Photo, "Wandering," was exhibited in January 2013.
architecture truly begins to mean something. Quick: home. Then there was the time everyone agreed to meet at the restaurant afterwards. I showed up to find you waiting outside just as perplexed. No one was inside so we carried on. On our own. The first was no longer touring yet if the second was was in town it could be planned. Across the movie theatre isle; walking in as it dimmed. Same name; two locations. You kept your word. Draw: art about art. Carla Danes (b. New Jersey) received a BFA from the Rhode Island School of Design, Providence, both an AAS at Fashion Institute of Technology, New York and a MS in Early Childhood Education at Hunter College, SUNY, New York, and completed her MFA at Otis College of Art and Design, Los Angeles, in 2002. 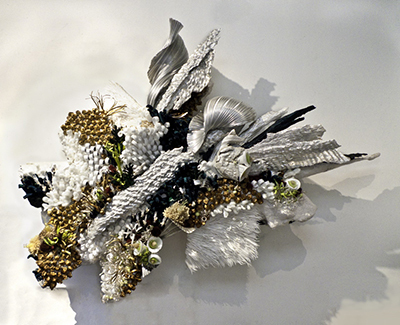 Exhibitions include “Bloomin Coral” in the group show “Story of O” at Ben Maltz Gallery, Otis College of Art and Design and in the lobby of the Torrance Art Museum (2010/2011). 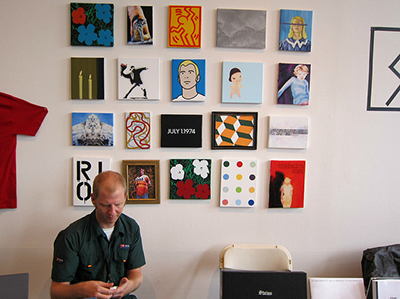 “Doin It” was an installation of a 100 small pieces at Kruglak Gallery, Oceanside, CA (2009). Her solo exhibition titled “Tabletop Jungle” was featured at The New Chinatown Barbershop. Among numerous experiences, she is a volunteer at Santa Monica College in the Etching Studio and is a member of the Los Angeles Printmaking Society. Carla currently lives and maintains a studio with her husband Christopher in Venice, California. Quick: faith. My crippling reply was not a threat. No one actually knows what takes place behind this wall. Not even me since I have no legs anymore. They were lost at the beginning of my disappearance. I left my fingers there; even the term phantom limb doesn’t apply to an absent torso. Still I’m floating; two circular orbs. Aqueous. Draw: art about art. Melanie Authier (b. Montreal, QC) received a BFA from Concordia University, Montreal in 2002 and completed her MFA at the University of Guelph in 2006. 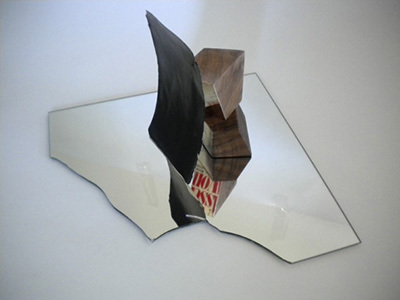 Solo Exhibitions include Nobody's Geometry at the Faculty of Fine Arts (FOFA) Gallery at Concordia University in Montreal (2010) and Warrior Ridge at the Michael Gibson Gallery in London, ON (2010). 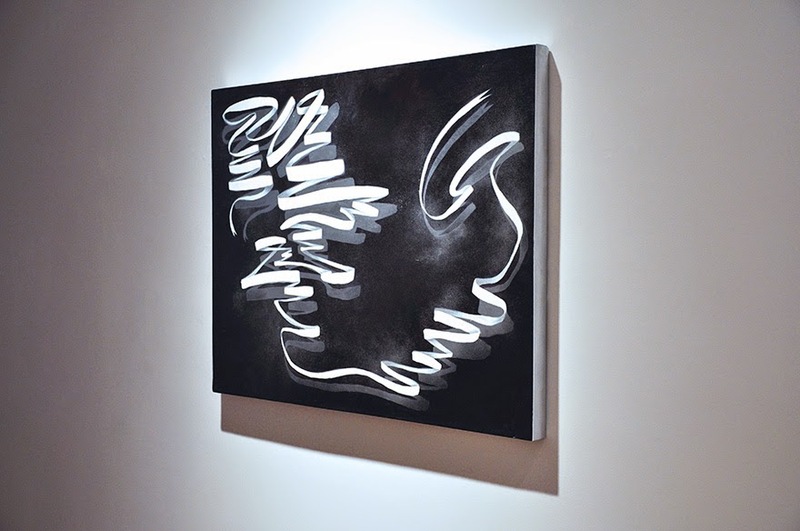 Her most recent solo exhibition titled “The Ribbon and the Lightning Rod” was featured at Georgia Scherman Projects (2010/2011). Among numerous scholarships and awards, she is the recipient of the Honourable Mention Prize for the 9th Annual RBC Painting Competition 2007. Authier's artwork is in numerous national and international collections including the National Gallery of Canada. 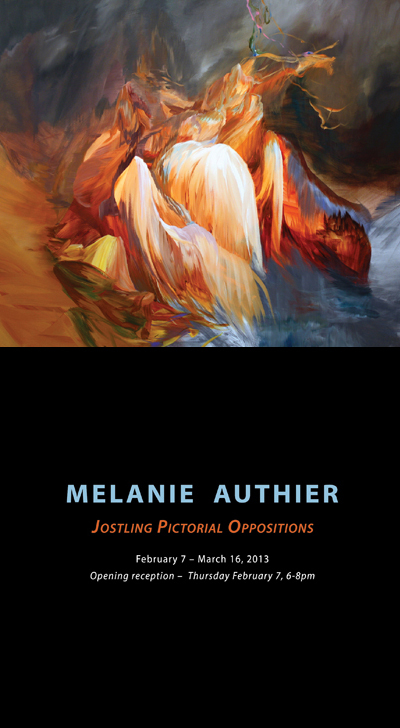 Melanie Authier is represented by Georgia Scherman Projects and her latest solo exhibition “Jostling Pictorial Oppositions” opens this Thursday February 7 and runs until March 16, 2013. She currently lives and maintains a studio in Ottawa. Quick: mystery. The power of art is a wonderful thing. Image image transporting us from the cars cares and concerns of our workaday world into; we read about them everyday in our newspapers; we see them every night on our television screens. Surrounded by such misery and degradation, our sensitivity becomes coarsened and our spirits desensitized. I promise you this. Draw: art about art. Jonathan Scott (b. Glasgow, UK) Jonathan Scott is a Scottish artist based in Toronto. 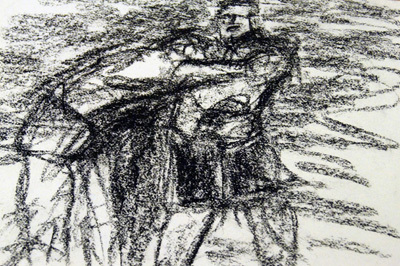 He received his Master of Fine Art from the Glasgow School of Art in 2005 and subsequently was granted a number of significant awards, including a Henry Moore Foundation Grant. He has made a number of solo exhibitions in the UK, and has exhibited internationally, including Australia, China, Mexico, Sweden, Germany. Recent exhibitions include 'Face of an Angel, Voice of a Demon' (commissioned by EmergeD as part of the Glasgow International Festival of Contemporary Visual Art); 'New Ruins' (EmergeD in the City Watch House, Melbourne); 'Re-escape' (Transmission Gallery project in Hamburg); 'Exit Strategy' (CAFA, Beijing); 'Syncopations: Art from Great Britain Now' (Wetterling Gallery, Stockholm); 'Prospect Drawing Prize' (Tea Buildings, London). 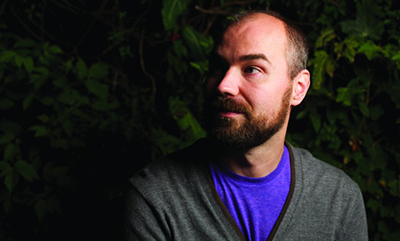 Scott lives and works in Toronto, and is represented by Katharine Mulherin Contemporary Art Projects, Toronto. Quick: prism. You’ll be my mirror. It’s nice to have your pick when an avenue advances in seven directions. Thinking of a better band name. This is why you spend so much time in your studio. Following your leads. Covering your tracks. Reissuing before restoring is required. Demolishing your citations.Draw: art about art. Rachel MacFarlane (b. Scarborough, Ontario) received her BFA, graduating as the Drawing and Painting Medallist from Ontario College of Art and Design in 2008, and has also received a Certificate of Advanced Visual Studies from OCAD Florence Satellite program in 2009. Solo exhibitions of her work have been presented at Nicholas Metivier Gallery, Toronto and Howard Park Institute, Toronto. 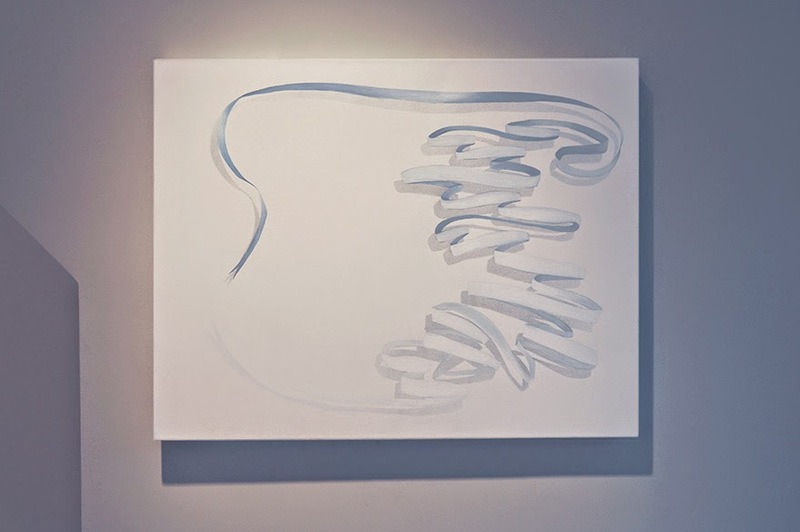 MacFarlane's work has been included in many group exhibitions including Nicholas Metivier Gallery, Toronto; X Pace, Toronto; Beaver Hall, Toronto; Triangle Arts; NYC, Studio 21, Halifax; among others. MacFarlane has participated as a visiting artist at the Triangle Artists Workshop, NYC in 2010, and at Cow House Studios, Ireland in 2012. 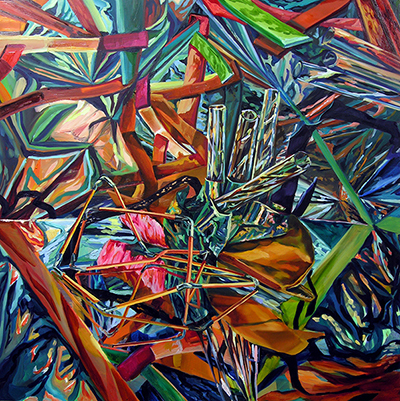 MacFarlane lives and works in Toronto, and is represented by Nicholas Metivier Gallery, Toronto. 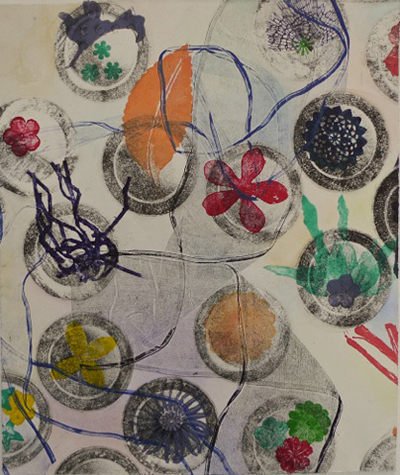 Rachel MacFarlane's second exhibition with Nicholas Metivier Gallery runs from January 3 - 26, 2013. Opening Reception: Thursday January 10th, 6pm - 8pm, 2013.